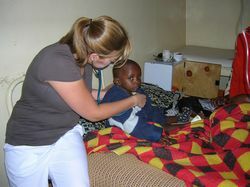 Hospice volunteer work is available in several locations in Kenya. We currently have hospice placements near Nairobi and in Meru. The hospices care for cancer and HIV/AIDS patients of all ages including children. The hospices meet real needs for palliative care in a poor rural community of Kenya. Hospice and hospital volunteers do not need any specific skills to help. Hospice care experience or experience working with the terminally ill patients would be welcomed. However, if it is your first time to volunteer at a hospice, some hospice training for volunteers will be provided. The volunteering at a cancer hospice or general hospice is suitable for all age groups. 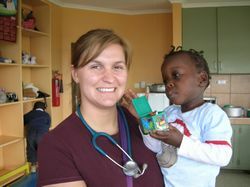 It is a good volunteer opportunity for pre-med students to help aids patients in Africa. It is also good for nurses, doctors, and other medical personnel. Skilled and unskilled personnel are welcome to apply. Hospice volunteers brighten the days of HIV/AIDS sufferers, cancer patients and others with terminal illnesses. Helping hands and warm hearts are always needed to give care and comfort to the patients who would otherwise suffer unspeakably. Hospice Volunteer Project Locations: The projects are based near Nairobi and in Meru. Meru is 3 hours drive from Nairobi. This is mainly an agricultural area of small scale farming. The population served by the hospice is poor. As a volunteer in a hospice you will help staff with a range of tasks such as feeding and caring for the patients. At the children hospice, volunteers can teach basic life skills as well as cook for and play with terminally ill children. Volunteers at the children hospice also keep the children busy through story telling, painting and other activities that children enjoy. Qualified doctors and students take part in all aspects of the hospice support and care including consultations, teaching, hospice counselling, and home visits. At the end of the volunteer period, the doctor/student is fully aware of the scope and value of palliative care for patients for whom cure is not possible. The hospices work with admitted patients, outpatients and do home visiting. Many terminally ill patients travel long distances from the rural areas for treatment. Home visiting may involve long journeys over difficult terrain. The visits are made regardless of the distance in all areas of operation. The Hospice medical team and volunteers make two or three home visits daily to such patients. They assess patient’s needs and problems, educate the family on how to care for them and give medications. The home visits are made to terminally ill patients who are discharged from hospital when curative treatment will no longer help. Visits are also made to those with advanced illness and are bedridden or too weak to travel to the hospice. The patients visit the hospice day care centre for treatment and to meet and share their experiences amongst themselves. They are provided with a balanced diet and reviewed by the medical team. Other activities are included to make their day and hospice support worthwhile. HIV/AIDS patients visit the hospice for group therapy. They socialize and share experiences. This enhances their psychological support and they are able to live more positively with their condition. Topics related to HIV/AIDS such as Nutrition, ART etc are taught. The hospices offer psychological and spiritual care for patients. This enables them to come to terms with and prepare for their own death as fully as they can. Volunteers are involved in giving counselling and support to the families and close associates of patients before and after the death of the patient. The support system to helps families to cope during a patient’s illness and in bereavement. Well trained hospice volunteers also provide skills to hospice staff.